Teams need a workspace and the ability to dispatch work based on skill level, security level, department or responsibility just to name a few. Other teams may also need to view or react in these requests as well. OTRS uses queues to provide your teams with structure. Queues provide a powerful way to divide and disperse the work to the responsible group of people. Use this screen to add queues to the system. In a fresh OTRS installation there are 4 default queues: Raw, Junk, Misc and Postmaster. All incoming messages will be stored in the Raw queue if no filter rules are defined. The Junk queue can be used to store spam messages. 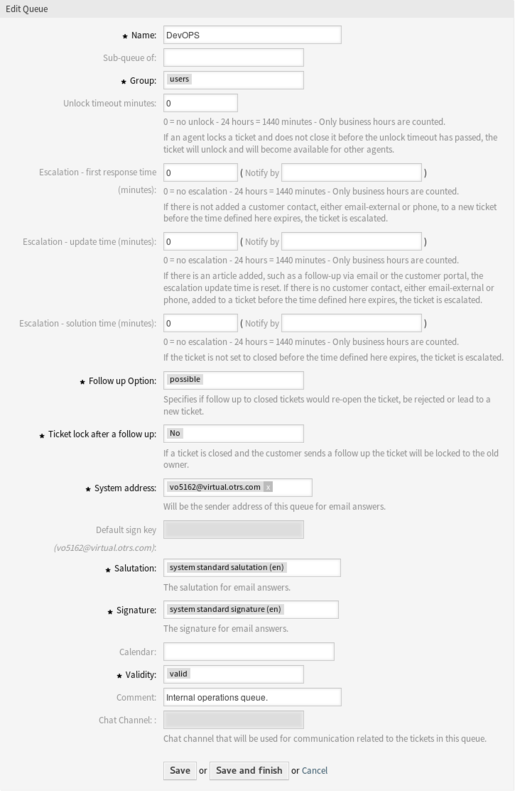 The queue management screen is available in the Queues module of the Ticket Settings group. Click on the Add Queue button in the left sidebar. Queues can not be deleted from the system. They can only be deactivated by setting the Validity option to invalid or invalid-temporarily. Click on a queue in the list of queues. If several queues are added to the system, use the filter box to find a particular queue by just typing the name to filter. Apply the change and also update the affected settings. Apply the change, but don’t update the affected settings. The updates need to be done manually. Changing the name of this object should be done with care, the check only provides verification for certain settings and ignores things where the name can’t be verified. Some examples are dashboard filters, action control lists (ACLs), and processes (sequence flow actions) to name a few. Documentation of your setup is key to surviving a name change. It is possible to add the new queue under an existing one as sub-queue. This will be displayed as Parent Queue::Child Queue. It is possible to limit access to the selected group. The group creates a permission link between the queue and an agent or a customer user. Any ticket on open, which is locked, in this queue will automatically unlock after the set amount of minutes. The value 0 (default) means tickets in this queue remain locked. The maximum amount of working time allowed before the agent contacts with the customer. First response time will not trigger for an email ticket or telephone ticket created by an agent. The maximum amount of working time allowed between the agent contacts with the customer. 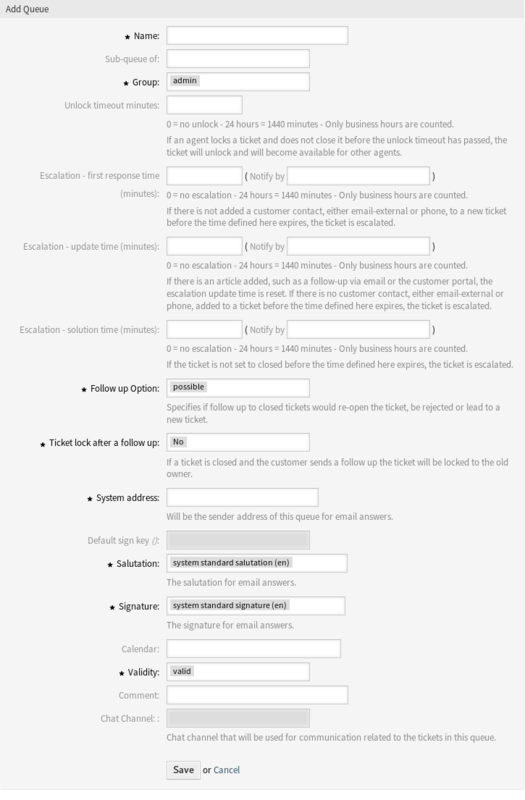 The maximum amount of working time allowed until the ticket is marked as solved. Solution time will not reset if the ticket is reopened. The follow up will create a new ticket. The follow up will reopen the already closed ticket. The follow up will be rejected. See Auto Responses chapter for more information. Only applicable if the Follow up Option is set to possible. Locks the previously closed ticket, upon reopening, to the last owner. This ensures that a follow up for a ticket is processed by the agent that has previously handled that ticket. This does not take out-of-office into account. Use this setting with care to ensure or in combination with Unlock timeout minutes. Select one of the Email Addresses as the sender identity for this queue. This is an ID in the database. Making changes to the Email Addresses can have adverse effects here. This is only active if PGP Keys or S/MIME Certificates is enabled in the System Configuration. Choose the key to sign emails per default. Select one of the defined Salutations. Select one of the defined Signatures. Select the calendar which defines working hours for this queue. Calendars are defined in the System Configuration. Chat channel that will be used for communication related to the tickets in this queue.